This year  marks the fiftieth anniversary of the death of the great Anglican poet TS Eliot on 4 January 1965, and the one-hundredth anniversary of his marriage to his first wife Vivienne Haigh-Wood on 26 June 1915. Last week, I handed out briefing notes for Brian Gilbert’s 1994 movie Tom & Viv, which we are watching this evening. This movie tells the story of a turbulent relationship. They were married after a brief courtship, and they separated in 1933. But they never divorced, and it was only after Vivienne’s death in 1947 that Eliot married his second wife, Valerie Fletcher (1926-2012). The film is based on a 1984 play of the same name by the British playwright Michael Hastings, and was adapted as a screenplay by Adrian Hodges. 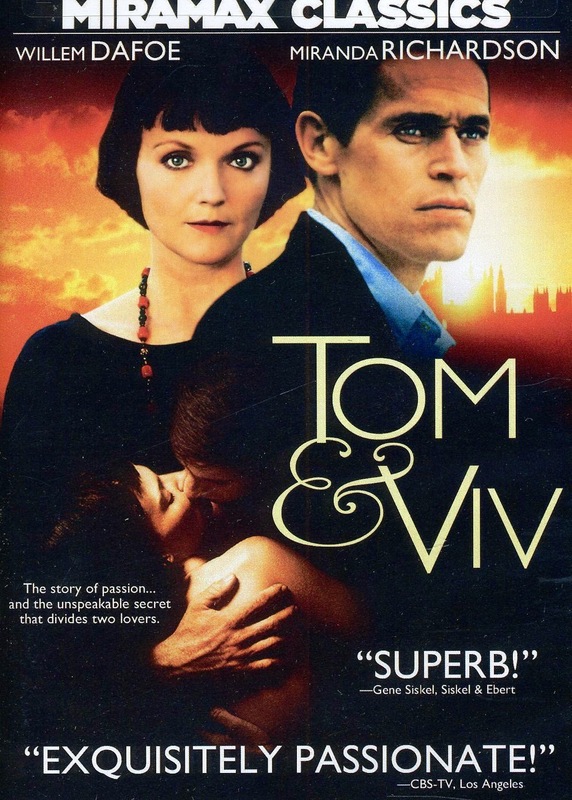 The makers of Tom & Viv claim it is a “truly passionate, tragic and wonderful story about an extraordinary couple who found great love but couldn’t handle it.” They say it enhances TS Eliot’s reputation by showing how his art grew directly out of his life. 1, That he took the credit for writing poetry, notably parts of ‘The Waste Land,’ that were written by Vivienne. 2, That he betrayed his deep love for Vivienne (and his muse) in his eagerness to become a member of the British literary and religious establishment. 3, That he was cold, ruthless and self-absorbed. 4, That he got hold of Vivienne’s money by becoming an executor of her father’s estate. 5, That he incarcerated Vivienne in a mental institution when she was in sound mental health, cruelly refused to visit her, and – while he went on to enjoy world renown – allowed her to languish there for nine years until, cheated and neglected, she died of heart failure at 58. It appears Eliot continued to care about Vivienne after her breakdown or the breakdown of their marriage. During World War II, he wondered if she should be moved to Brighton or somewhere, with a private nurse, in case of being bombed. But why did he never visit her? Is there any basis for the chocolate story? It is said that liked vanilla ice cream with hot chocolate sauce. One day he was eating it in a restaurant once when a man opposite said: “I can’t understand how a poet like you can eat that stuff.” With hardly a pause, Eliot retorted: “Ah, but you’re not a poet” … and continued on eating. Contrary to the depiction of his character in the movie, Vivienne’s brother, Maurice Haigh-Wood, wrote a moving letter he wrote from the trenches in 1917 in the spirit of Wilfred Owen or Siegfried Sassoon. Her father, far from being a despised philistine, was a painter; her mother never reproached Eliot for his treatment of her daughter. Nor did Vivienne resist his going into banking, resent his conversion, or batter at the doors during his baptism and confirmation in 1927. There are other emphasises that critics see as distortions in the movie. For example, it dramatises the honeymoon in Eastbourne in 1915, but Eliot’s mentor Ezra Pound makes no appearance in the film. This evening’s programme begins in the Church of Ireland Theological Institute at 7 p.m. Meanwhile, I received confirmation this week that I have been invited to give two papers at the 11th annual Heinrich Böll memorial weekend on 2 to 4 May in the Cyril Gray Hall, Dugort, Achill Island. In one paper, I hope to look at the role Edward Nangle’s wealthy patrons played in shaping the ethos nbd policy of the Achill Mission, while the second paper provides an opportunity to look at TS Eliot’s Irish connections and to re-examine his attitudes to Irish people. This is an interesting opportunity on the 50th anniversary of his death and in the light of TS Eliot’s role in encouraging Louis MacNeice, who had many family links with Achill Island.